Website speed and performance are vital for user experience and SEO, yet most modern WordPress themes are painfully slow. We’ve found 3 super-fast WordPress themes that go against this trend and focus on speed and performance. Why do speed and performance matter in WordPress web design? There’s plenty of evidence to show that slow websites will put off your visitors. Think about your own experience – if a website takes more than a couple of seconds to load, don’t you give up and look elsewhere? I certainly do. This is supported by statistics: I recently read that for every extra second your site takes to load, your bounce rate (the number of people who leave your website immediately) increases by 7%. Sparks is a clean, comtemporary-looking theme with plenty of whitespace. 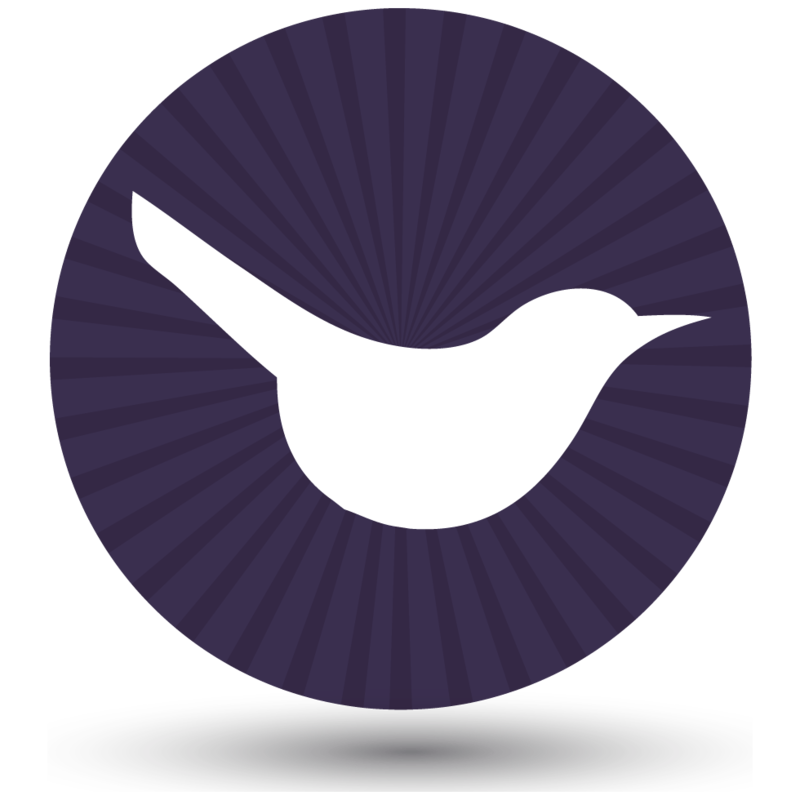 Everything is super-streamlined behind the scenes – it’s not code-heavy and is very fast to load. It’s fully responsive (great for mobiles and tables) and unlike some other fast-loading themes, it actually has plenty of features. Sparks has a blog, portfolio, good choice of shortcodes (without going over the top) – everything you’re likely to need when designing a WordPress website, but no more. It’s a nimble theme that focusses on the task in hand. The design combines effective typography with plenty of whitespace. This is invaluable to designing a fast WordPress website because most modern themes require lots of images (and often huge images) in order to look as good as the theme demo site. By focussing on the words, Sparks puts your content to the forefront and emphasises what’s important. Its nice simple layout separates content very well, creating a site that is easy on the eye and professional. If you look behind the scenes at the code, we spotted several opportunities to make Sparks even faster. If you set it up yourself then you can create a pretty fast, or if you use an experienced WordPress web designer can they they can design a site that’s even faster. The Sparks demo site takes 2.6 seconds to load, largely because there are quite a few images. However we have used this WordPress theme to create a site that loads in approx. 0.5 seconds – and that’s without any caching or other separate performance plugins. Blox is an eye-catching theme with a clean and modern design. However it’s still super-fast due to being light on code. Compared to Sparks, it has a more positively unusual layout which will make your content stand out. The full-width rows allow you to divide your homepage into distinct sections that grab visitors’ attention. The use of bold colours and repeating patterns achieves this without the need for the large parallax images that are so popular at the moment and can slow down your website. Blox is responsive and optimised for mobiles, tablets and other screen sizes. The code is clean and bloat-free. Like Sparks, Blox packs in all the features that most WordPress websites need without slowing things down. You can use it to design a professional WordPress website that is streamlined and optimised for performance. The Blox theme demo takes 4.07 seconds to load, however they have fitted in some large images which could easily be left out. Like Sparks, an experienced WordPress developer will find opportunities to make Blox even faster so it’s a great choice. The Sparks and Blox themes achieve a good balance between speed, design and features. 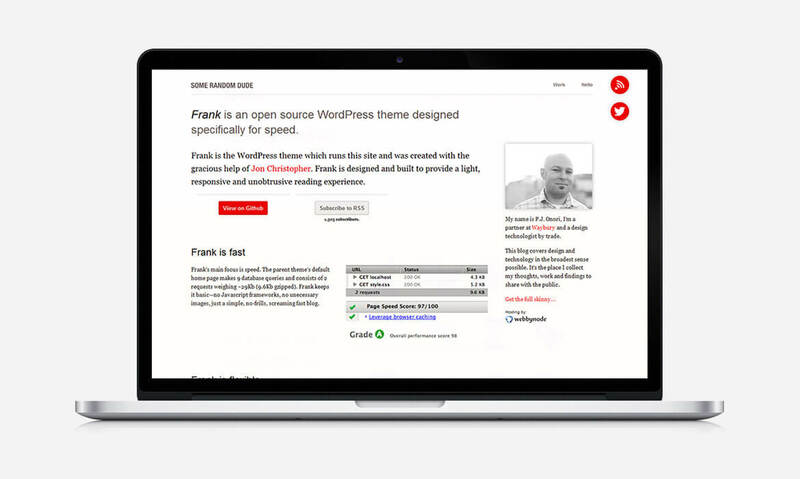 If speed is your number one concern, and you’re prepared to compromise on design and features to achieve a faster WordPress website, then Frank is the best option I’ve found. Frank has a clean design and is less fully-featured than many themes, but it’s exceptionally quick. Really quick. While the design could be described as slightly dated, it’s well-suited to text-based content with minimal images. It’s responsive and works well on mobiles and tablets. You can use it to create flexible page layouts. It’s a free open-source theme and is continually updated by the WordPress community. The Frank demo site loads in 1.65 seconds. Based on the above shortlist, which WordPress theme should you choose? If you’re looking for a WordPress theme that is lightweight and ultra-fast to load then hopefully one of these themes will be suitable. Whatever you do, don’t go on ThemeForest and choose a theme that’s packed full with features – you will pay the price in terms of speed and performance. If speed if your over-arching priority, go for Frank. If speed is important to you but you also need some extra features, shortcodes etc. then look at Sparks and Blox and choose the theme with the design that works best for you. If none of the themes listed above are suitable then another option is to design your own – custom WordPress themes can be incredibly lightweight. You have full control over the quality of the code, and only have to include the features you definitely need with no added bloat. If you’re looking for a lightweight custom WordPress theme then please get in touch, or we can help you by setting up your website using one of the themes recommended in this article. Hi George, the Frank theme itself is super-fast so there must be something else slowing down your website. You can use free tools such as https://tools.pingdom.com/fpt/ and https://developers.google.com/speed/pagespeed/insights/ to get advice on the different factors that are adding to your page load times. You can also install the P3 Performance Profiler plugin to see if any of the specific plugins installed on your site are slowing things down - but I doubt it would be the Frank theme itself. I hope this helps, let me know how you get on! Tried everything nothing worked and reverted back to our old WordPress theme. Nice write-up :) I love how everything is easily structured. However this article is slightly dated, I have helped put together a similar comparison displaying the speed test result of the themes I mentioned. I think it might be of interest to your readers. You can see my results here: https://www.wpmultiverse.com/blog/fastest-wordpress-themes/ Let me know your thoughts? Hi Brian, thanks for the link - yes it's helpful to have some newer themes here. Thanks, this post is a couple of years old so it's good to add some newer ones to the list. Great Collection and informative article. I would like to share Kosmic WordPress theme. It is a fast and multipurpose theme, and it is best for eCommerce business.